Nature-Cide Granular Insecticide is labeled for tick control, as well as for several other crawling pests and emerging larvae. The water-activated formula, which has 25(b)-exempt status, can be applied in the rain. 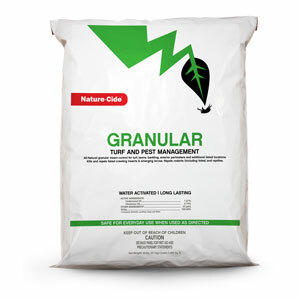 It also can be added to fertilizer for a one-pass application on golf courses, turf, commercial and residential exterior landscapes. It’s available in 20-pound bags, 50 bags per pallet, through Target Specialty Products, Univar and Pest Control Supplies (PCS).